Sylvie, this is adorable, I love the stamp, must shopping online again! Great colouring too. Hi Sylvie, that's again a fabulous card. Just great, perfect, amazing! I love the twine and the stars too! Such a sweet card Sylvie. Perfect for the LIM challenge. This is Super, just love those Lili of the valley stamps, your colouring is FAB. Fantastic card. Love this stamp. Beautifully coloured. Great image, love the colouring. Sylvie - this is just adorable. I love the image - so cute and beautifully coloured. The car show sounds like it was good too! 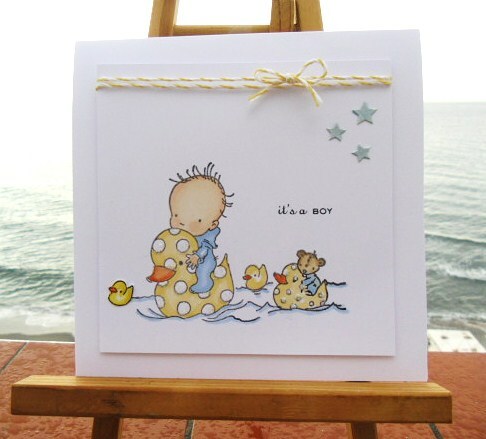 A lovely card & such a sweet image, perfect. How lovely! What a pretty card! Delightful card Sylvie. Love it. oh my gosh, sylvie!! what an absolutely adorable card!! that image is just too sweet! Absolutely adorable Sylvie! Love this. Sylvie this is just adorable. Hope you both ok? Oh Sylvie that image is adorable. Fabulous card. This is so gorgeous, Sylvie! I love it. Beautifully coloured and what a sweet image! Sylvie....those images are ADORABLE!!! 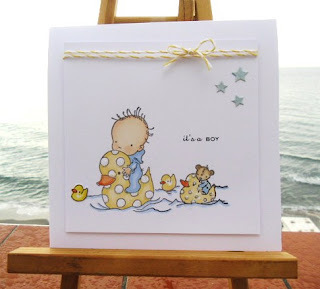 Love this cute card...and your coloring is fabulous! Gorgeous card! Big hugs from me and Tilly! Beautiful card, such a nice job of coloring with the pastel shades. Sooo cute and beautifully CAS. That image is darling Sylvie - not sure how I've missed that LOTV release. I love your soft shading of it too. Eek! This is beautiful. I love your coloring, the stars, and the bit of twine. Just gorgeous. Ann Y. What a lovely scene (the card and behind the card!). I love that you took this sweet stamp and kept the accents to simple twine and bitty stars - it's wonderful!